Hi all!! I found this at Walmart yesterday, it's called the Knook. 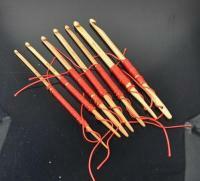 It is a way to knit with a crochet hook. I'm excited about it because I've been wanting to learn to knit for a long time (I only know how to do the most basic knit stitch) but I just can't put down my crochet hook I thought it was kind of like tunisian, and I guess it is a little bit. There are a bunch of new pattern books out too. You can find them on Annie's Attic. I've been thinking about trying it. Would like to know what you think of it after you use it. I got knook hooks somewhat accidentally from eBay. I didn't know what they were but they were wooden hooks very cheap. Then I found a Knooking group on Ravelry with tips and patterns. Haven't used them yet, but am looking forward to doing so. I have seen that, thought about getting it, just haven't had the extra $$ yet! I don't know if I'm going to have time to fiddle with it until after Christmas (I also just got myself the Boye round loom kit from walmart... 4 looms, a hook, and needle for only $12.97!!) I have too many darn gifts to make first!! I have seen websites with knooking directions and it looks pretty easy. I will say, however, that ultimately you could probably knit faster by just learning how to knit. I will be the first to admit that there is a pretty big learning curve for regular knitting and I feel that I am still learning all the time. 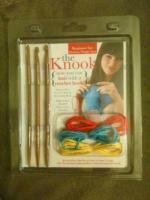 I had the loom kit - it's what my husband got me last year for Christmas. LOVED it!! Helped me make hats for my boys last year, cause I couldn't get 'em to turn out right by crocheting them!! If you want to learn to knit but aren't sure about hooking the yarnwith a straight needle, arm yourself with two Bates hooks (the Boyes give me trouble, but YMMV) and make a first row of Tunisian, Turn the whole thing around and instead of finishing the Tunisian row, draw up a loop in each loop. Lather, rinse, repeat. That is a good idea, I also only use Bates hooks (the Boye ones are too pointy for me and get caught on the yarn) Thanks for sharing!! I've never tried a bates hook, I'll have to try one. My hooks are always snagging the yarn. I often think the same thing. I have in fact used Tunisian crochet hooks to knit. It goes a lot quicker for me. I like knitting. I just get so frustrated that it takes so long. Regarding Knooking, I've tried it and don't care much for the technique. The stitches get too small on the string and get difficult to work the hook into. Doing the knitting with the Tunisian crochet hooks gets me where I need to go. There are others that love Knooking though so I don't want to discourage you at all. Let us know what you think! I got that same thing about six weeks ago but I haven't tried it yet. Maybe after I get my holiday hooking done I'll give it a go. I'm interested in it. Since I do knit and crochet, it shouldn't be that hard to learn. And they have a lot of pattern books out there, so maybe after the holidays, when we are snowed in, I can give it a try. About the Bates vs Boye hooks. I used to only use Boye but once I tried a Bates I was sold. I was having the same snagging problem. I keep wanting to pick up that book myself. I too own Looms. and I love them.. I learned to knit first, and crochet shortly thereafter around 1970, but haven't knitted much after learning to crochet. I wanted to pick knitting back up a couple of years ago and thought I'd try knooking first. I know a lot of crocheters love the techniqe, and I'm not knocking knooking, but for a knitter ( how many times can I type kn in this sentence?) I agree with Nicolep. I really felt it was much harder to pick the stitches off a cord, even with a hook, than to pick stitches off a needle with another needle. Really, it IS knitting but with a string as your second needle, and if you already knit there's no advantage to knooking. The gauge is different, but it's not faster. You can knit any knook pattern. I think trying to learn to knit with 2 tunisian hooks is an awesome idea , and probably a better 'training wheels technique' for a crocheter to learn to knit than the knook. I bought a book from Annies Attic I believe, called Knit one Purl two. 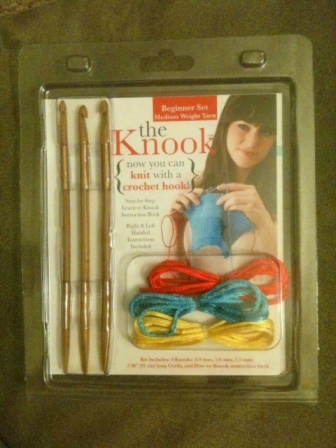 It is instructions for knitting with a crochet hook. It is not as easy as it may look. Not to me anyway. I can't get past CO . I do knit also. Not as much or as fast as crochet but I know the basics and have made a few baby blankets which turned out well. I like the look of knit but prefer crochet. That is why I got it. It is still buried somewhere after my move and may stay there for a while. I am finding it hard to find time to even crochet right now.